In many ways, playing Fantasy Football is like gambling. There's always a large degree of luck built into the game. However through skill, practice, research, and following a strict set of self-established (but practical) guidelines, one can gain a competitive edge over other opponents and improve their overall chances of winning. One of the tools you can use in your quest to gambling success is Betulator. B.J. Goodson missed last week's game after suffering a knee injury in practice earlier in the week. Calvin Munson filled in for him and had a very nice game with 8 total tackles and a sack. Goodson should be back next week, however. Vic Beasley suffered a slight hamstring tear last week and is expected to miss around 4 weeks. Brooks Reed and rookie Takkarist McKinley project to take on larger roles in his absence. Nick Kwiatkowski is feared to have suffered a torn pectoral. If true, he would miss the remainder of the season. Christian Jones would be the next man up and play every down next to Danny Trevathan. Kwon Alexander exited the Bucs' Week 2 contest against the Bears with a hamstring injury and did not return. Tampa Bay had the game well in hand, so it's hard to tell if that's why Alexander didn't return or if the injury is fairly significant. We should have a better sense of his status later in the week. If he can't go, rookie Kendell Beckwith would slot into the every down MLB role (a role in which he played quite well in last week). Jamie Collins suffered a concussion towards the end of last week's game. He will have to pass through the proper protocols before returning to the field. Jarrad Davis is also in the concussion protocol after taking a hit from Odell Beckham on Monday Night Football. Eric Reid is going to miss a few weeks with a torn PCL. If healthy, Jacquiski Tartt would take over his spot and would be one of this week's top DB waiver wire adds along with Matthias Farley. Tavon Wilson exited Monday night's game in the third quarter with a shoulder injury. His status will be updated throughout the week. With the defense struggling mightily, the Colts switched things up at the linebacker position and started Jeremiah George over Antonio Morrison. George played 79% of the snaps. This remains a situation to avoid for fantasy purposes. Lawrence Timmons went missing leading up to Sunday's game and was eventually found at the airport. He's been suspended indefinitely for violating team rules. We don't have a good idea of how long this suspension will be but given the strangeness of the situation, it could be some time before Timmons sees the field again. The Raiders continue to rotate heavily at middle linebacker. Tyrell Adams, Marquel Lee, and Nicholas Marrow all saw time at the position. The only linebacker to trust on this team at the moment is Cory James. Deshazor Everett saw full-time action in Week 1 while filling in for Su'a Cravens; however, that changed in Week 2 as he split time with Montae Nicholson. This is another situation to avoid for fantasy purposes right now. DE Noah Spence (TB) - Spence was a player I highlighted in my IDP sleepers article leading up to the season, so I'm glad to see him get off to a solid start with a sack and a forced fumble. Double-digit sacks are within reach if he can see enough snaps but the low tackle numbers likely limit him to a DL2 ceiling. DE Mario Edwards (OAK) - Edwards is an under the radar talent who hasn't been able to live up to his potential due to injury. He finally seems to be healthy however and it's showing in the box scores with two sacks already this season. At a position that is fairly thin, Edwards makes for a nice early season pickup. DE Julius Peppers (CAR) - At this stage in his career, Peppers is only going to see the field in obvious passing situations. Playing 30-35 snaps a game isn't going to be enough opportunity to be a top-end fantasy producer, but playing on a limited basis is keeping him fresh and maximizing his pass-rushing potential. So it's not entirely surprising that he already has 2.5 sacks in his first two games since re-joining the team that drafted him way back in 2002. He has a couple of tough matchups coming up in the Saints and Patriots but is worth a look in deeper, big-play leagues if you are struggling to fill your third or fourth DL spot. WLB Vincent Rey (CIN) - Rey continues to be one of the league's best tackle producers on a per snap basis, generating 22 tackles over the season's first two games. We will get one more week of every down status with him while Vontaze Burfict serves out the last game of his suspension. 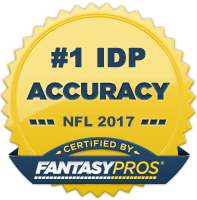 Take advantage of this and start Rey with confidence against a Green Bay offense that is set up to control the time of possession coming off a Week 2 loss to the Falcons. WLB Ramon Humber (BUF) - With stat lines of 12-0-0 and 7-4-0 to start the season, it's hard to ignore Humber any longer. We saw a somewhat similar situation develop in Buffalo last year where Zach Brown emerged over Preston Brown as the top IDP commodity on the team. He's a below average talent but seems primed to produce in this role and he doesn't have much competition behind him to threaten his starting status. Owners should view him as a high floor LB2-. MLB Mike Hull (MIA) - With Rey Maualuga not yet ready to see game action and the totally unexpected departure of Lawrence Timmons from the team this weekend, Hull was forced into an every-down role and he produced to the tune of 7 solos and 3 assists. As long as he continues playing in this capacity, he's worth a streaming add as an LB3-. ILB Zach Cunningham (HOU) - Cunningham looked great while filling in for a suspended Brian Cushing, showing great sideline to sideline pursuit. He only played 67% of the snaps as fellow rookie Dylan Cole saw some playing time as well. But given Cunningham's talent, I would expect that percentage to inch up closer to 100% over the next couple weeks and I'd be surprised if Cushing got his starting job back. Cunningham is a must add in dynasty leagues and a great stash in redraft leagues with a fairly deep bench. SS Matthias Farley (IND) - Farley has already racked up 18 total tackles over the season's first two games and saw his snap percentage jump up to 100% in Week 2. The Colts have serious issues at both inside linebacker spots and their defense is going to be on the field a ton which makes Farley a DB1 play in tackle-heavy leagues until further notice. FS Jordan Poyer (BUF) - Poyer has been perhaps the biggest defensive surprise of the season so far with 14 total tackles, 2 sacks, 1 interception, and 5 pass deflections, grading out as the top safety in the league according to Pro Football Focus. He's done pretty much nothing in his career up to this point, but the Bills have a history of turning unheralded defensive players into IDP studs, so he's worth the add. Consider him a DB2. SS Vonn Bell (NO) - With the Saints severely struggling on defense for another season, the coaching staff benched Kenny Vaccaro. Perhaps this was just a temporary one game thing to send a message to the team or it's maybe more long term. If Vaccaro continues to be restricted to a backup role or is released/traded, Bell becomes the next guy up and a worthwhile waiver wire add in a lot of IDP leagues.